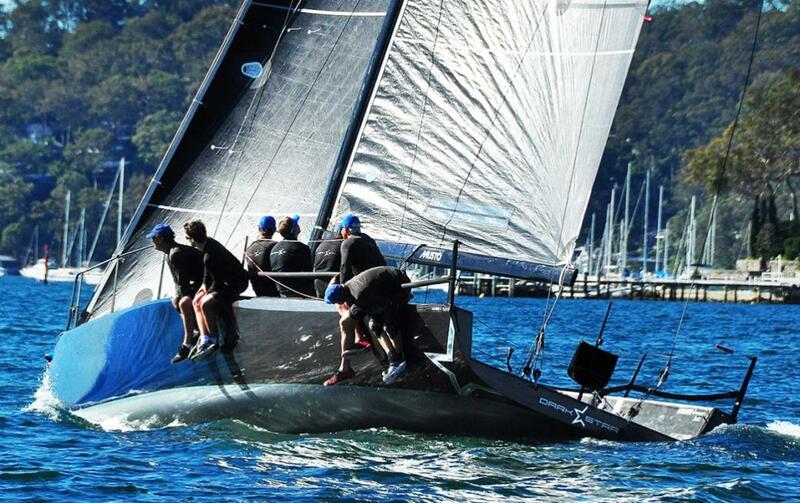 Two wins apiece in light and fluky winds on Pittwater has the host club’s Dark Star leading Neville Crichton’s Maserati by a point on overall scores after day one of the MC38 Winter Series. A harsh autumn sun and 24 degree day juxtaposed the series’ name for the opening event of a four-part winter pointscore running from May to September between yacht clubs on Sydney Harbour and Pittwater. Dark Star’s owner John Bacon and his long-time tactician Cameron Miles know Pittwater as well as is possible, given the topography of the narrow waterway with hills both sides and Scotland Island acting as a sizable wind barrier. This knowledge plus finding high gear meant Pittwater treated them well. Sydney Harbour blow-ins Maserati (Cruising Yacht Club of Australia/Royal New Zealand Yacht Squadron) and Ginger (CYCA) have had their successes on Pittwater and Maserati came to this regatta as the most recent class victor, at the MHYC Autumn Regatta three weekends ago when Chris Way drove. This time Crichton, who had another engagement, handed the helm to Farr 40 owner/skipper Martin Hill. Maserati’s tactician Joe Turner said with some sarcasm, “Lovely Pittwater in winter... actually it wasn’t too bad and a couple of things went our way. Changing helms is ok; us six guys have been together for a year and we are starting to gel. Martin is an excellent helm and slots in perfectly with the team. “Neville has a lot going on outside sailing but he’s planning a full tilt starting with the August series; he’s excited to come racing again,” Turner assured. Debriefing on today’s efforts Turner said his crewmates gave him plenty of stick for a couple of their starts. “I have a suntan inside and out after being burnt by the crew for some bad tactical decisions. I’m all emotional,” he joked. Four points off second is Leslie Green’s Ginger followed by Steve Barlow’s Lightspeed and Chris Hancock’s Vino. Set up between the eastern side of the island and Newport, the Royal Prince Alfred Yacht Club’s team of race officials managed four races on a “tough old day” described race officer Steve Merrington. The breeze started out in the NW then went to due north and back to NW, 5-10kts with the odd 12 knot puff. 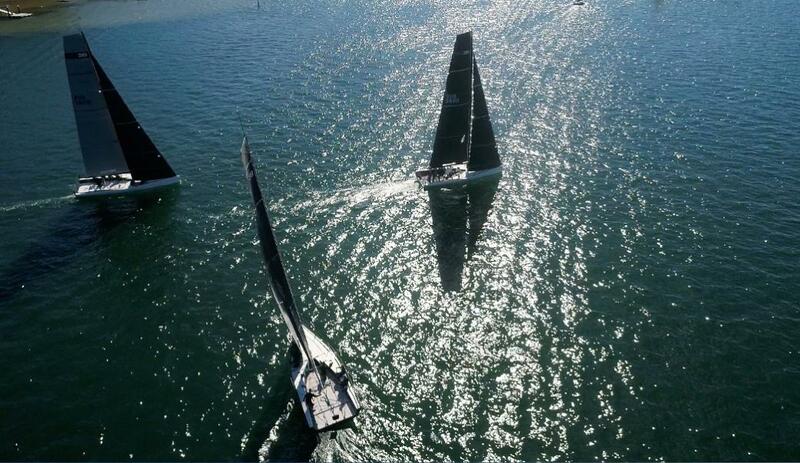 Racing recommences for the one design fleet at 1000hrs on Sunday May 7. For the June 17-18 regatta the fleet will welcome new owner Chris Way and Easy Tiger, formerly Menace. Neville Crichton’s Maserati, with the captain at the wheel for day two of the MC38 Winter Series, scored 3,2,2 on Pittwater which was just enough to triumph in the opening regatta of the class’ four-part winter pointscore. This comes on top of Maserati’s Autumn Regatta victory three weekends ago on Sydney Harbour. Leslie Green’s Ginger bounced back from Saturday and lodged two bullets in the sou’west winds 8-15 knots, moving them into second overall by a single point. John Bacon’s Dark Star had one of those Pittwater days and finished third in the fleet, two points off second. Dark Star went close to being the catch of the day south of Longnose Point on Pittwater’s western shore when they skimmed past a small fishing boat at full stretch in the SW gusts piping out of Morning Bay. It was one of the more epic downhill runs in the best breeze of the regatta, the crew weight parked at the aft quarter as the bow threw up jets of salt water. At the host Royal Prince Alfred Yacht Club the winning skipper Neville Crichton said, “We came to today second and any of the top three boats - us, Ginger or Dark Star - could have won it. It came down to the last race. Steve Barlow’s Lightspeed rose above the tough crowd in race 5, tactician Seve Jarvin and the crew finding an edge and scoring the race win. In the final race 7 Barlow showed his quick reflexes when he threaded Lightspeed, with a kite up, in between two upwind boats screaming “starboard”. 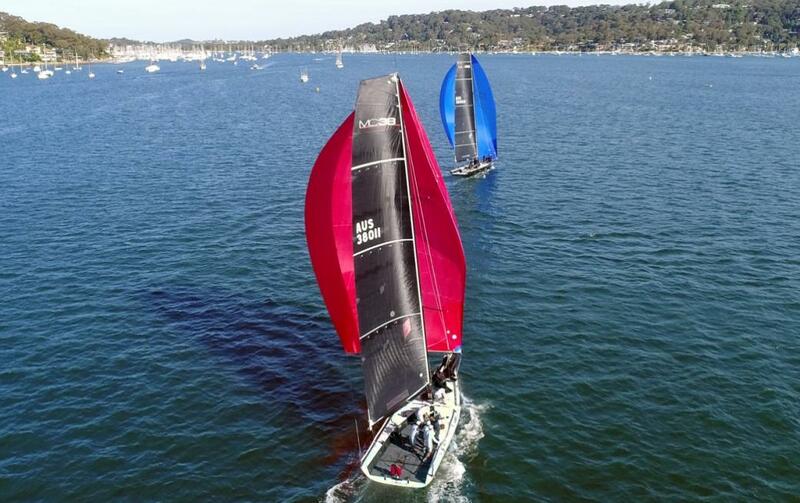 For the June 17-18 regatta on Sydney Harbour out of the Royal Sydney Yacht Squadron the MC38 fleet will welcome new owner Chris Way and Easy Tiger. 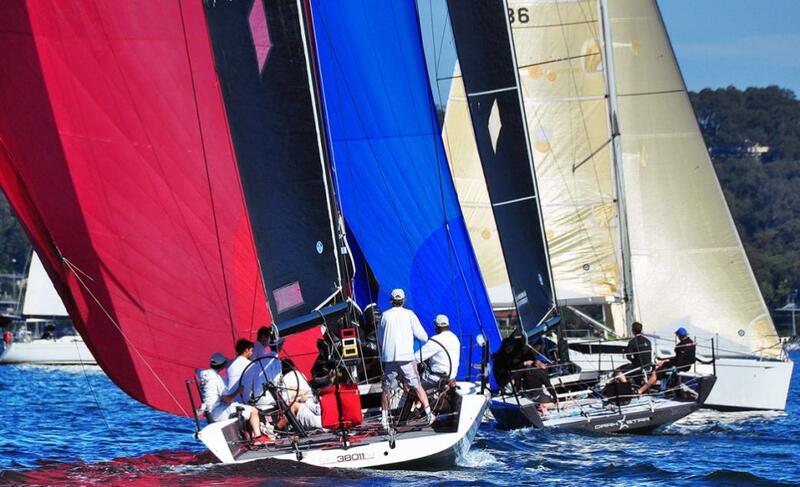 The July 15-16 regatta will be back on Pittwater.